UEFI boot doesn’t suffer from this problem, since it does away with the legacy VGA interface. So if your video card’s firmware supports UEFI/EFI boot (my R9 280X already does), you can switch the guest to boot using OVMF instead. This requires us to use a macOS bootloader that supports UEFI. I chose Clover. However, there’s an issue at the moment with Clover and QEMU which causes macOS’s detected CPU speed to be wrong. This makes window animations, the system clock, movie players, typematic repeat, etc., run much too fast or too slow. On Proxmox 4.4, we have to patch Clover to fix this, follow the instructions in the next section. Proxmox 5 has support for telling macOS exactly what the CPU’s frequency is, by exposing a VMWare-style interface that macOS knows how to read. This fixes the CPU speed problem. So on Proxmox 5, we can just edit the VM configuration to enable this feature, and afterwards we can install an unmodified official Clover release (I’m using r4097) using the install instructions further down this page. 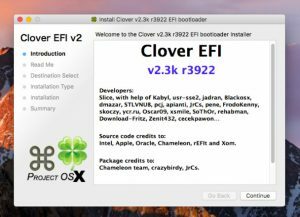 You can either just download my prebuilt patched Clover r4061 / EDK2 r24132 installer, or follow the instructions in this section to patch and build Clover yourself. We’ll be following the official Clover building instructions, but we’ll be modifying those slightly. Install XCode from the App Store before you start. Run “sudo xcodebuild -license” to accept the license agreement. Run “sudo xcode-select –install” to ensure the command-line tools are installed. Note that when the instructions say to make a directory called “src” in your home directory, you should listen! There are hardcoded paths that will look for built tools in that directory, so it’s much easier to just go with the flow here. You can skip the line that runs “./buildgcc-4.9.sh”, since we’ll be using XCode instead. User “arne ziegert” over on the Clover issue tracker came up with a patch to fix the CPU speed issue on QEMU, which we’ll apply before we build Clover. The default options, which use XCode to build an X64 bootloader, are perfect for us. After that completes, run “cd CloverPackage; ./makepkg”. This will produce an installable package for us in “edk2/Clover/CloverPackage/sym/Clover_v2.4k_r4061.pkg.”. In Proxmox 5, we don’t need to patch Clover, we just need to enable the vmware-cpuid-freq feature on the CPU in our VM’s configuration. At this point you might want to take a snapshot of your Sierra install, so you can roll things back if it goes wrong. Though note that we will still be able to boot with Enoch/SeaBIOS even after we’re done, so if you mess up Clover/OVMF, you should be able to switch right back to SeaBIOS in your VM options to fix things. 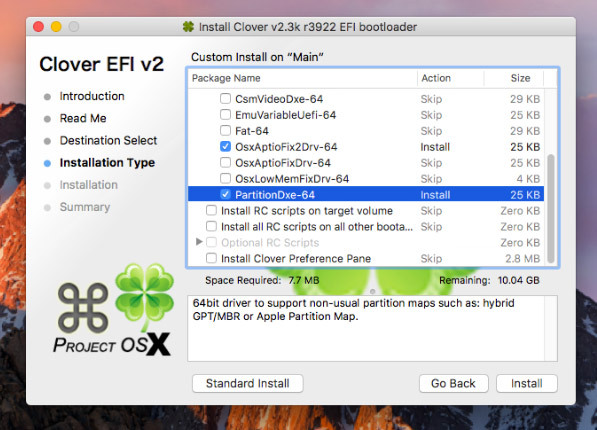 The Clover installer should leave the EFI partition mounted for us. Open that up in Finder. Replace the EFI/CLOVER/config.plist file with this one, which I got from Spaceinvader One’s unRAID tutorial. Rather than installing Clover by executing the .pkg on the guest, you can attach a dedicated Clover disk to your VM and just fill it with a Clover disk image that I’ve prepared. On the hardware tab, add a new disk of size 1GB to hold Clover (if you’re already using IDE0 then add to IDE2). On the options tab, change the boot order to boot from this drive. If you haven’t already switched your VM settings from SeaBIOS to OVMF, change the BIOS type to OVMF on the options tab, and add an EFI disk to store UEFI settings on the hardware tab. Be sure to get the device name correct so you don’t overwrite the wrong drive! 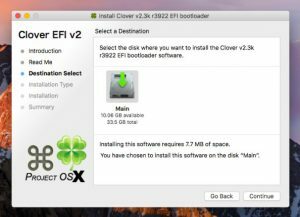 Now you should be able to use this Clover boot disk to boot the Sierra installer, or an already-installed copy of Sierra. 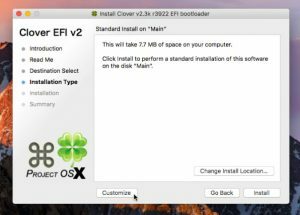 Noticed this post too, can you install this bootloader before OSX has installed? Yes, that should be possible. I’ll see if I can get it to work, and upload a Clover disk image for you. I’ve now added a section to the bottom of this post which has the Clover disk image and instructions for using it. Did you accidentally overwrite the proxmox EFI settings disk with another volume? Try removing the EFI disk from the hardware page and re-adding it. 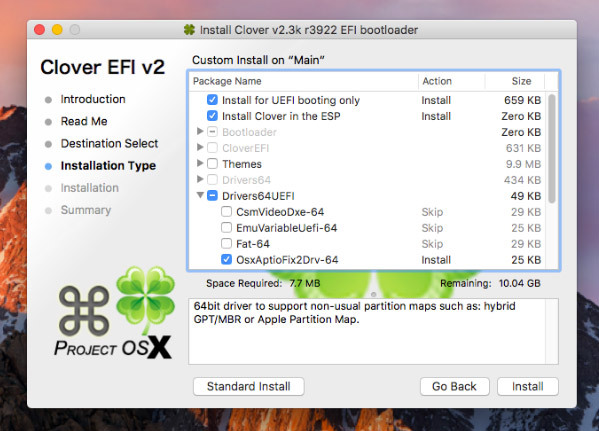 I dd the clover to the EFI partition, was I supposed to just add another HDD and dd the Clover to that? The “EFI” disk you see is a 128kB file that Proxmox uses to store UEFI settings like boot screen resolution and boot disk selection. You’re not supposed to touch that one! I’ve updated the blog post to be a little more clear there. Can you paste your VM config at pastebin or something and link it here? You have “machine: pc-q35-2.4” commented out, this needs to be present. Add “-smbios type=2” to the args line, remove the “kvm: 0” line. Does the boot loader not also need to be on the iso? Nope, the bootloader on the disk should offer to boot from both the hard drive and the install CD for you. Nick thanks for your help. I am ready to give up. Which may refer to a CPU issue, but I cannot seem to get it fixed. Yeah, it’s sounding like a hardware problem at this point. Which CPU do you have? I suppose if it is older than Penryn then it might be missing features that macOS is trying to use. (The config should be advertising the CPU as Penryn). Yep they are old Xeon E5310. Ahh, that CPU is Clovertown, the generation previous to Harpertown, which was a Penryn derivative. It doesn’t have SSE4.1, which is a Sierra requirement. Do you think El Capitan will run? I think it will, there’s a lot of complaints about the SSE4 requirement of Sierra which makes me think that it wasn’t required previous to that. 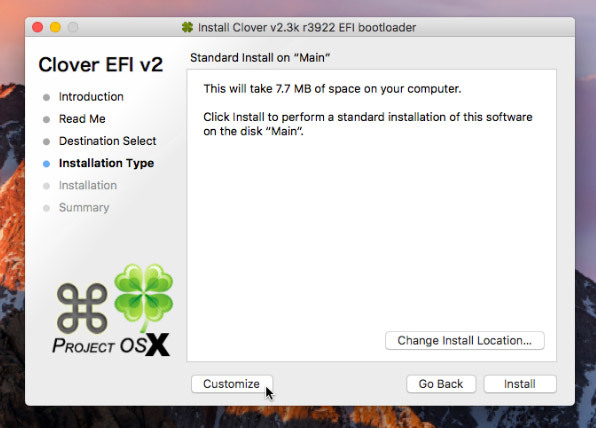 You should be able to use a similar install process, using the Clover bootloader disk you added. On the args line of your VM configuration, change Penryn to core2duo. I haven’t tried El Capitan myself. Made the install Iso with Diskmaker X. do you think that could be the problem. Do I need to do something special to the iso? I would use the build instructions from my Sierra post. It runs a whole bunch of commands to make the ISO in that script. EDIT: oh, right, the script requires a Mac to run on which you don’t have. Forget that then! Most likely place for things to be going wrong is the Clover configuration, but it’s hard to know what to tweak there. Add the “kernel” parameter back to the args (described in the first blog post) and switch back to SeaBIOS boot. Then boot direct from the CD image (remove the Clover volume). Thanks for all your help, I have managed to get an install of El Capitan. I was able to achieve this on Sierra by switching to OVMF/Clover boot. After that works, enable automatic login for your user in the Mac settings, and enable Mac screen sharing. 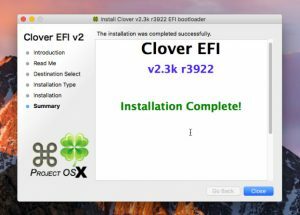 Mount the EFI volume and edit EFI/CLOVER/config.plist to change the screen resolution from 800×600 to 1920×1080. Reset the VM. 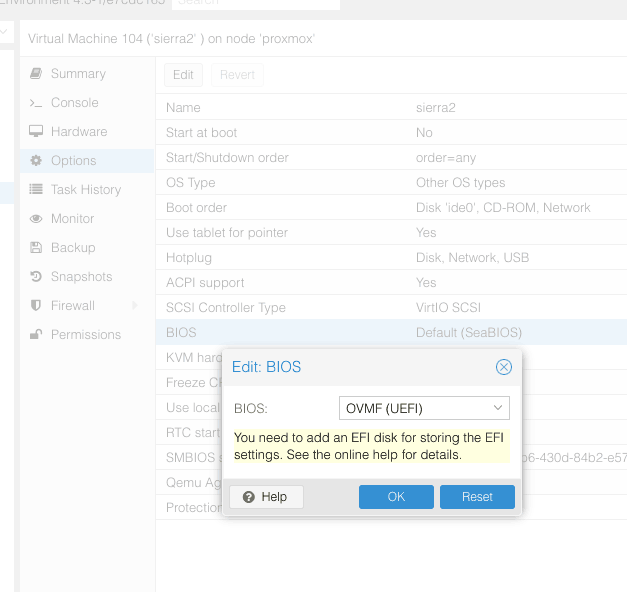 Enter the Proxmox OVMF configuration by pressing F2 during boot, set the screen resolution in the “Device Manager/OVMF Platform Configuration” section to 1920×1080, and reset to boot macOS with the new resolution. Connecting using VNC or Screen Sharing from another machine now reveals a perfect 1920×1080 display (though somewhat lacking in video acceleration). To do better I think you’d have to pass through a supported PCIe video card. don’t forget to mount the right EFI volume – just had a faceplam moment when i realized I’d mounted the EFI partition that lives on the main mac os x disk rather than the dedicated EFI disk. I have my Sierra installed and working with pass through of my XFX HD7870 using SeaBIOS. But if I try using clover it hangs every time at pci configuration begin, I’ve tried multiple boot args nothing works. What am I overlooking? The video card works fine using OVMF with a windows guest and pass through. 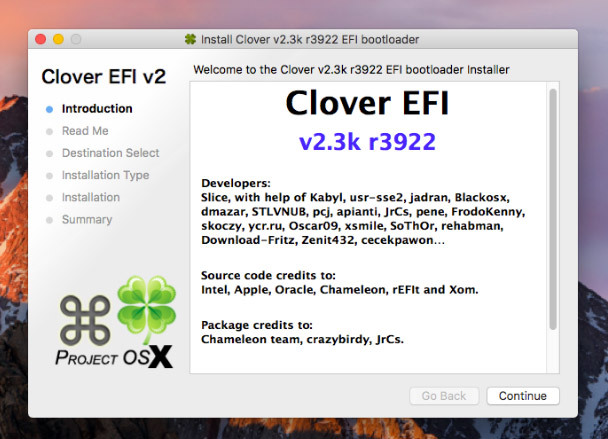 Also clover boots fine if I don’t add the video card to the guest. Searching for that error and “hackintosh” turns up a lot of Clover setting tweak suggestions, so it sounds like this is a problem that happens even on physical machines and there’s good hope of finding a solution in there. I can’t think of anything myself. Ya that’s what I’ve been searching for so far none of the suggestions have worked. I’m gonna try a clover install directly on my hardware next and see if I have same issue. Great guide too by the way very helpful on setting up proxmox for Mac VMs!! Either way worst case I can run using SeaBIOS it’s just not ideal for my server setup…. I did a reinstall recently and had this same problem. I found that power cycling the host (not just restarting it) cleared it. I guess the card gets into a funny state from which it cannot be properly reset. Whenever I try clover (I’ve tried this howto several times) I get to a white apple logo and then nothing. No status bar. If you hit space at the main Clover screen, you can choose boot options. Try turning on Verbose mode, might give a clue to where it’s stopping. Terry here again, hoping you can help. I have not run my El Capitan VM in some time, and changed nothing other than putting more RAM in the host. I now get a VM Swap Subsystem is ON, and the boot process halts there, any idea? As I recall, Proxmox has an option to run MemTest from its boot menu, I’d give that a go to make sure the new RAM is okay. You didn’t make any changes before it stopped working? Maybe the filesystem is damaged, I would boot from the install CD and use the terminal there to examine the disks (some combination of diskutil list and fsck_hfs). 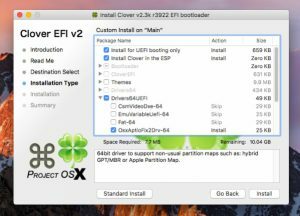 Are you using Clover/UEFI or Enoch/SeaBIOS to boot? Do you have the USB mouse and keyboard entries at the end of /usr/share/qemu-server/pve-q35.conf as described here? After I updated the Mac OS I got an kernel error. Is it not possible to update the Mac OS normally? I’ve not had any problems applying updates to mine. The Problem I’m having is similar to Terence Faul – I’m seeing no disks once the machine boots to the clover screen. my processor is a xeon 5600 series so i believe that shouldn’t be the problem. I removed that section because it was out of date (won’t work on 10.12.4) and I’m not sure if it was ever able to successfully boot the installer anyway (I don’t recall the results of those tests). I’ve put it back now with a note that it’ll only work on 10.12.3 or older. Your configuration looks identical to mine, except I’m using IDE0 and IDE2 rather than SATA. I can’t work out why it would be that some people’s installers can’t see the disks, seems like a very odd problem. I’ve heard it’s possible to partition the disk images using Linux beforehand and the installer will see it then. I’ve updated that last section now with the newer Clover 4061 to support 10.12.4! thanks for putting it back – i eventually realized that my OS X disk image was 2.5ish GB too small. I went back to the real mac and reran the process of making the disk image – for what ever reason it worked – clover saw it and i was able to format the other disks just like your instructions say to do. I’ve got 10.12.3 so i think i’ll sit on it like that till proxmoxs’ qemu gets patched but its nice to know I’ve got options – many thanks! I am trying to do a fresh Install of Sierra on a Proxmox KVM. Your tutorials are very simple to understand so its the perfect starting point for me. I tried your previous tutorial but impossible to get my OSK key so I switch to this tutorial. I stricly followed it, I can boot to Clover, I can use Keyboard/Mouse, but when I boot to the Sierra Installer, The screen is stuck as soon as the Mouse is appearing. 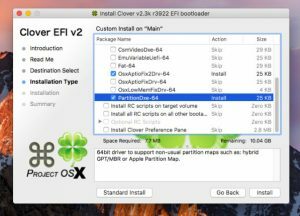 I tried recently and was unable to boot the install CD using Clover. 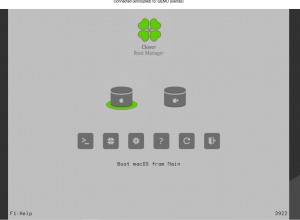 Use the SeaBIOS approach instead and install Clover later if you want it. The OSK in the config you posted is perfect. because i was unable to get the OSK with the small C program. Do you have an idea to get a valid OSK ? The OSK you posted in your configuration was already perfect. The key is not a string of random letters or anything. My guide on “installing Sierra on Proxmox” is complete as far as I know. Note that you have to get Sierra working completely that way before trying to convert it to Clover (I’ve never been able to boot the Sierra installer using Clover). The OSK key is a requirement for booting Sierra. You can probably google for someone who has leaked it online if you don’t have a Mac to read it from.